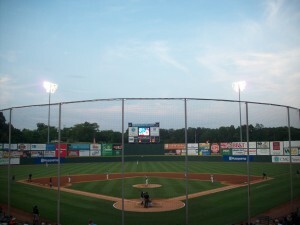 * Note, since our original publishing, the Charlotte Knights have moved into their new – and much closer to home – stadium. Click here to read our current review. 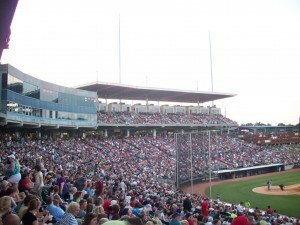 Ballpark Basics: An outdated (and out of town) ballpark that is celebrating its final season. Ballpark Breakdown: Many times we have had to drive a short distance outside of a city to find a brewery to pair with ballpark. While many ballparks have migrated back downtown, many breweries have been forced to build just outside of downtown due to zoning laws. It was just the opposite with our trip to Charlotte. While the team takes the name Charlotte the team actually plays in Fort Mill, SC. (Yes, you read that correctly. The team does not even play in North Carolina, let alone Charlotte). Fort Mill is 18 miles south of Charlotte and according to the Knights website “just two miles across the NC/SC state line.” Not an ideal situation, but one that after more than two decades of play is quickly coming to an end. 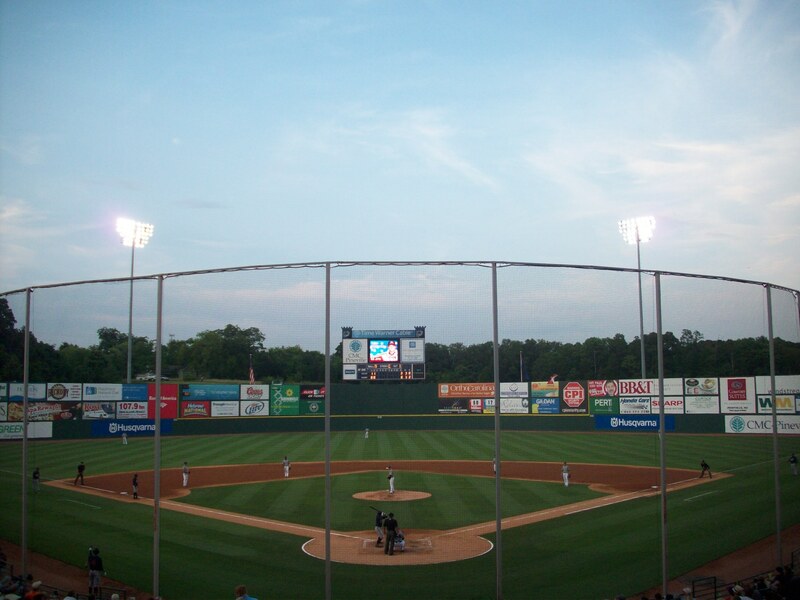 For next year the Charlotte Knights will pack their bags and move uptown to open BB&T Park in their namesake city. Until then however, there remains Knights Stadium. 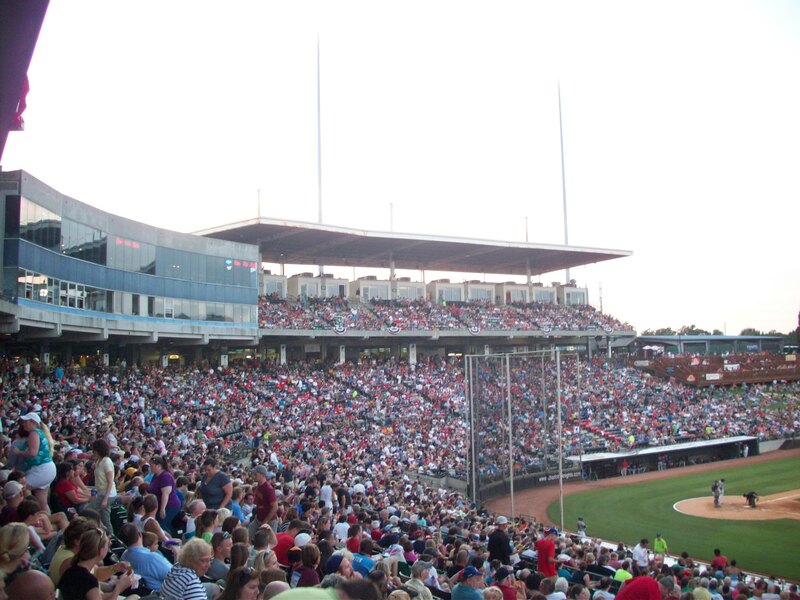 Originally designed with the ability to expand to 40,000 seats to attract Major League Baseball to the Charlotte area, the Fort Mill location opened in 1990, but the design makes the park seem much older than a 23 year old stadium. In fact, many things about design of this ballpark scream eighties. From the expansive parking lot right off the interstate for easy access you walk up to minimalist structure of cinder block. Jutting out from the façade of the cinder block is a row of windows with blue panes. Once inside you enter the main concourse. While the ceiling is low giving it a cramped feel the concourse does open up to the lower grandstand and the field is visible while walking along. There are two grass berms down each foul line for additional seating. 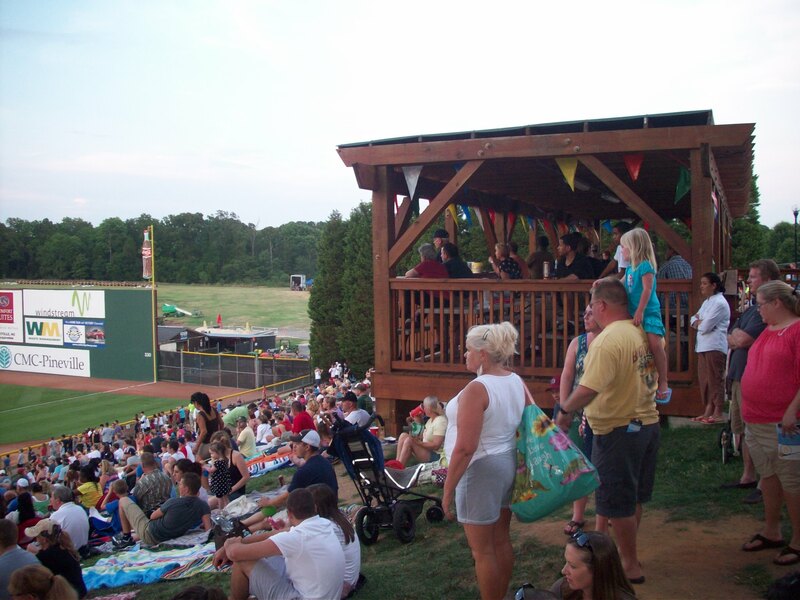 In the left field corner you will find The Party Deck, a multi-level deck with picnic tables that can be rented for corporate or family outings. There is a smaller deck down the right field line as well. Here is where you will also find the Children’s Play Zone with a merry-go-round, inflatable games and a climbing wall. Heading up to our seats in the upper deck we climb a cramped stairwell to a much smaller concourse. This wouldn’t be a problem on a typical night but for larger crowds the cramped quarters are definitely noticeable. The suites are located here with a walkway to the upper deck seating between each suite. The seats up here actually give you a great view of the game and a decent breeze which we were thankful for on this humid evening. On the second level you can also find The Budweiser Brewhouse, right behind home plate. Here is a full service bar and restaurant with a great view of the action. The air conditioning also made this a popular place to be on our visit. Another interesting aspect of the upper level is the lack of restrooms. There is only one set up restrooms for this entire level. To help with overflow they added port-a-potties at the end of each side of the concourse (no we’re not kidding). We were there for a 4th of July game and apparently the after-game fireworks show is one of the best in the entire Charlotte metro area. The game was a sellout and there were even people who paid the $5 just to get a parking spot to watch the after-game show. After leaving the game there were still people lined up along the roads leading into the parking lots as well. 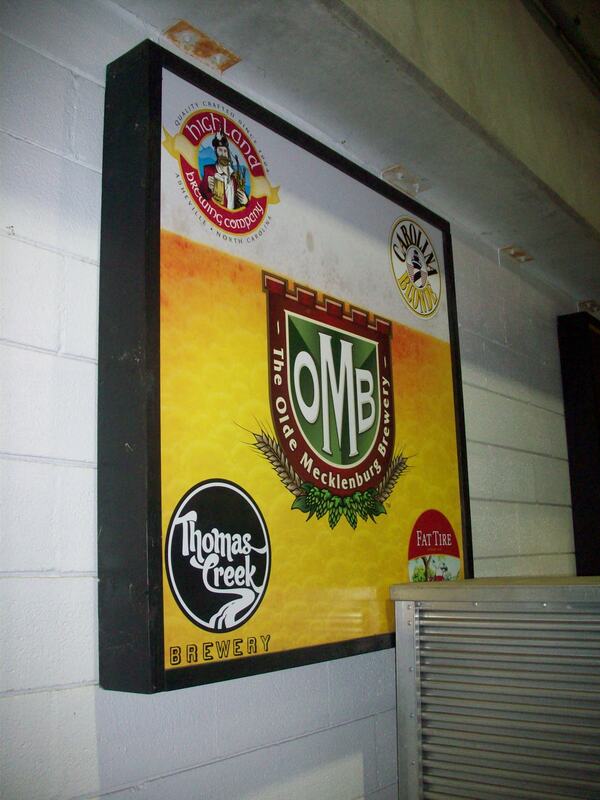 One good thing about Knights Stadium is its choices for craft beer. 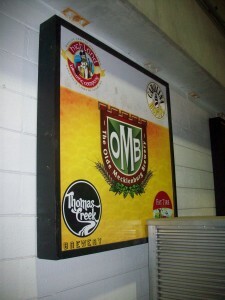 Not only is there the OMB Beer Garden, a special section on the third base side dedicated to the local brewery but there are other options as well including Thomas Creek, Highland, New Belgium, Red Hook and Widmer Brothers. The Knights have been trying to get out of Knights Stadium for quite some time and their wish is about to finally come through. The ballpark never really seemed to grab the attention of the local area. You can see how naming a team after a neighboring city in a different state can cause some animosity with both cities. It is also just long enough of a drive from Charlotte that you won’t get many of the casual fans. Hopefully with the new ballpark in uptown Charlotte, the Queen City can finally become a baseball town.